The point spread function (PSF), also known as the point response function (PRF), describes the shape and size of the image produced by a delta function (a point) source. This web page collects information and resources about the Chandra PSF. It is a work in progress and we expect to add additional information and links as time goes on. Chandra produces sharper images than any other X-ray telescope to date; and therefore, provides an opportunity for high-angular and spectral resolution studies of X-ray sources. Crucial to these studies is the knowledge of the characteristics of the PSF. 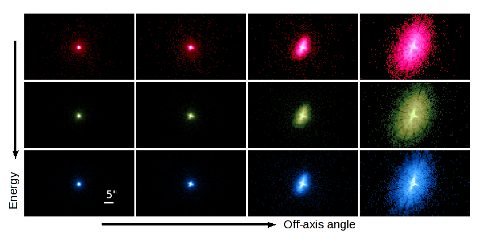 The observed Chandra PSF is smeared with the blur introduced to the High-Resolution Mirror Assembly (HRMA) PSF by a combination of the telescope dithering motion, the limited size of detector pixels, and detector effects (Figures 1 and 2). At sub-arcsecond scales, the Chandra calibration team has identified an optical artifact from the HRMA affecting the PSF, and seen in both ACIS and HRC observations. Details regarding the artifact are available on the Probing Higher Resolution: an Asymmetry in the Chandra PSF caveats page. The HRMA PSF produced by ChaRT/SAOTrace at the HRMA focal-plane consisting of all generated rays from the simulation (a). The same HRMA PSF weighted by the probability of the rays reaching the ACIS-I detector-plane (b) as detected by a perfectly uniform detector with 100% quantum efficiency, no contamination on the optical blocking filter and no bad pixels. 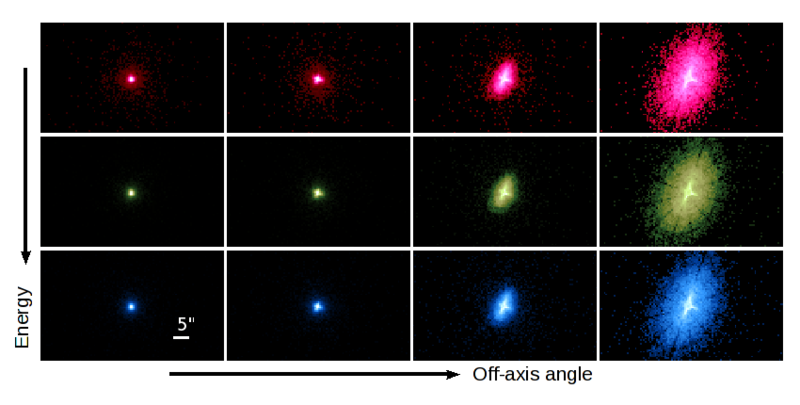 The Chandra PSF is the HRMA PSF smeared and modified by detector effects (c) and spacecraft dithering (d). 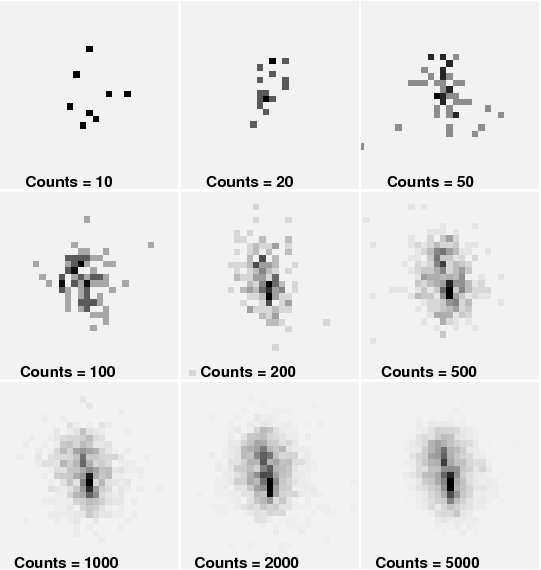 The spacecraft dither results in sampling multiple detector pixels at each point on the sky, which helps reduce the effects of bad pixels and pileup. The images are on the same spatial- and logarithmic color-scale. The pixel size in each case is that of the ACIS pixel. The image x- and y-axes are parallel to the spacecraft y- and z-axes, respectively. Summary of generating image for Figure 1 using an ASCII spectrum file. The radial profiles of the PSFs generated in the above figures, all normalized to their respective maximum count (left). The center and right figures show closeups of the PSF core and wings respectively. As expected, the dithered PSF (green) is the broadest profile while the HRMA PSF (black dash) is the narrowest. The PSF with idealized detector geometry effects included (red) is broader than the undithered non-ideal detector (blue) since the core dominates the ideal detector (center) while the PSF wings get many more counts in the non-ideal detector (right). The y-axes are on a linear-scale in the upper-plots and logarithmic-scale for the lower-plots. Summary of generating Figure 2 and the region files used to obtain the radial profiles. The shape and size of the HRMA PSF varies significantly with source location in the telescope field-of-view (FOV) and the spectral energy distribution of the source (Figure 3). Because of the HRMA's design (nested, Wolter Type I mirrors) and the PSF's dependencies, the image quality is best in a small area centered about the optical-axis. In fact, the mirrors were designed to produce images with 0.5 arcsec resolution and in particular to concentrate >85% of the energy at 0.277 keV within a 1 arcsec diameter (see the Proposers' Observatory Guide). The shape and size of the HRMA PSF varies significantly with source location in the telescope field of view and spectral energy distribution. The plot uses simulated PSFs at a set of off-axis angles (0 arcmin, 2.4 arcmin, 4.7 arcmin, and 9.6 arcmin) and mono-chromatic energies (0.92 keV, 1.56 keV, and 3.8 keV) from the CSC soft, medium, and hard bands. The appearance of the observed PSF also varies with the number of source photons, particularly at large off-axis angles. Consequently, off-axis sources are frequently misconstrued as extended or having multi-component structure. 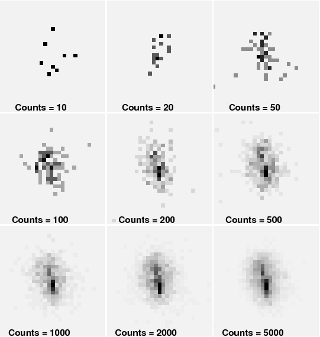 Users should note that morphological artifacts due to finite counting statistics are apparent, even with a surprisingly large number of total counts, as illustrated in the Figure 4. A simulated 1.49 keV point source, 5 arcmin off-axis. By varying the number of souce counts, the apparent morphology is strongly affected. A substantial pre-launch effort was directed at creating a faithful model of the HRMA mirrors and its mechanical and optical systems (Jerius et al. 2000); the "tuning" and the calibration of the HRMA PSF using the in-flight data is an ongoing process, as explained in the HRMA calibration pages. A PSF presentation from the 2014 Chandra Calibration and CIAO Workshop represents a good introduction to the Chandra PSF. Several tools of increased complexity are available to estimate the characteristics of the PSF at the location of the source: from quick estimate tools to full blown PSF simulations. Other tools make use of the derived Chandra PSF for subsequent analysis. The choice of one tool versus another is dictated by many factors, but primarily by the scientific goal of a specific analysis. The following pages are meant to guide users through the available tools and some of their applications.